At the airport: snow happens. In February 2010, snowstorms so inundated Baltimore-Washington International Thurgood Marshall Airport that outside help was needed to cart all the snow away. Luckily the snow-moving experts at Liberty Mountain Resort and Conference Center were willing to come over and help out with their Bully 600 ski slope and trail grooming vehicle. A creative solution to an icy problem and, as I found out for this column in USATODAY.com – Winter survival strategies from [some of ] the USA’s snowiest airports – not unlike the snow-situations airports around the country must face each winter. Like the plowed snow at many airports, registrations for the 45th annual International Aviation Snow Symposium are beginning to pile up. Held each April, most often in snowstorm-prone Buffalo, the symposium bestows awards on airports that excel in battling the white stuff and offers airport staff a chance to chill out and swap war stories about what went right or wrong, weather-wise, during the previous winter. So far this season, storms have triggered the cancellation of thousands of flights and forced the temporary closing of many airports. That means there’ll be plenty to talk about at this year’s conference, as attendees try to take in tactics to make you less likely to get stuck at an airport next winter. But when it comes to operations in unforgiving winter weather, not all airports are created equal. 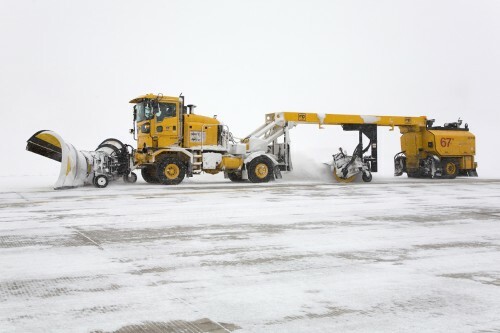 That knowledge, good planning and communication and the right equipment were all in place at Pittsburgh International Airport (PIT) last February 5th when a storm dumped more than 20 inches of snow at the airport. For its efforts during that storm, Pittsburgh airport won one of a coveted Balchen/Post Awards at last year’s International Aviation Snow Symposium. Dulles International Airport, Chicago O’Hare and the Greater Rochester International Airport took home first-place awards as well. Logan was closed for a just a few hours last Wednesday during a storm that dumped heavy snow on parts of New England. In Logan’s corner during that storm: a snow plan, determination and eleven, 68-foot long Vammas snow machines, each a giant plow, sweeper and blower rolled-into-one. When working in unison, airport officials boast that the Vammas fleet can clear a 10,000 foot runway in less than 15 minutes. Buffalo-Niagara International Airport, which hosts the annual aviation snow symposium, has won the Balchen/Post award multiple times. And although it gets an average of more than 8 feet of snow a year, it’s been more than three years since BUF has had to close due to snow. A few years back, Denver International Airport learned some important snow lessons the hard way. The problem was too big to sweep under a pile of snow. Instead, a consultant was hired; a study was conducted and DIA learned that, when it came to snow, the airport was inefficient, unorganized, understaffed and armed with not enough equipment. The fixes included retraining, reorganizing and reassessing snow removal priorities. And now, like other airports, DIA has a snow committee that meets year-round with airlines, the FAA and other airport stakeholders to make sure the snow control plan is realistic and up-to-date. Denver International Airport has also invested millions of dollars in new equipment and switched from single-function to more modern multi-function machinery that can plow and sweep at the same time. “So instead of taking 45-minutes to an hour to clear a runway, we can now do it in less than 15 minutes” says Ron Morin, Denver Airport’s Director of Aviation Field Maintenance. And instead of having a single snow team, the Denver airport now has eight; each with a dedicated function. Team members were offered the chance to name their machines, but they asked instead to name their teams. Now, whenever it snows, you’ll see the Snow Cats, the Marauders, the Taxi Way Tuxedoes, the Blizzard Busters, the Deice Men Cometh, the Ramp Rats and the Snow Dawgs taking care of business. Frisby and assistant manager Zaramie Lindseth know the airport has been closed due to volcanic ash, a windstorm, the 1964 earthquake and, like other U.S. airports, for a few days after 9/11. But they can find no records that show the airport has ever been closed due to ice or snow. No matter how well an airport prepares, though, sometimes snow happens and there’s really nothing anyone can do. All photos courtesy of the featured airports. Thank-you. Do you know an airport that does really well in the snow? Let us know!